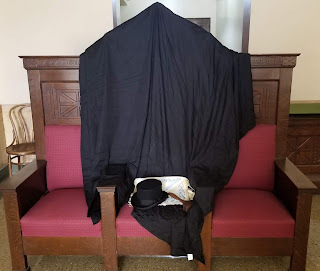 Last year at this time, I was lucky enough to receive permission to share my lodge’s Past Master’s Remembrance ceremony with you HERE. At the time, I wrote it from the viewpoint of the Master of the lodge, with more of a cold, analytical point of view, so that I could provide you with the script and staging instructions to hold your own ceremony. Now I’m the junior Past Master in my lodge, and would like to discuss the why, instead of the how. As you read in the linked article, the junior Past Master is responsible for the planning and execution of the Past Master’s Remembrance ceremony. They arrange the dinner, manage the printing and mailing of the invitations, the programs, and present the speech given. This is considered their last official act as Worshipful Master, and to say that a lot is riding on it is an understatement. I mailed the invitations at the end of April, which should have provided plenty of time for them to arrive, however a number of people still haven’t received them as of writing this article. We are experiencing a similar issue with donation requests that are being sent out from one of the foundations that I work with. As an aside, if anyone knows a solution to getting first class mail delivered reliably, please email me at adam@wcypodcast.com and let me know! Because many people didn’t receive the invite, turnout was significantly lower than expected, especially among the Past Masters. Out of the 31 living Past Masters in our lodge, there were only 7 in attendance (including myself), and attendance rates among the members and the widows was very similar. Very important lesson learned: while mail is good, you can’t put your entire hopes on it arriving. If I could advise future junior Past Masters planning this event, I would tell them to take a multi prong approach, by mailing the invite, then following up via email or phone. The dinner itself was good, if a bit overpriced by the caterer, and I fear I may have driven our secretary into a minor mental breakdown when he saw the bill. One of the only positives that came from such a low turnout is that we’ve enough leftovers for our business meeting next week, and so one meal was stretched into two. I know, I’m stretching a bit to justify the cost. Very important lesson learned: try not to spring a large surprise bill on the person who will be writing the check. After dinner, we retired to our lodge room for the ceremony itself, and I have to say that after having been out of the East for so many months it was a bit nerve-wracking being back up there. Even though I had practiced, and checked to make sure that everything would run smoothly, I was still back to being as nervous as I was at my first meeting as Master. 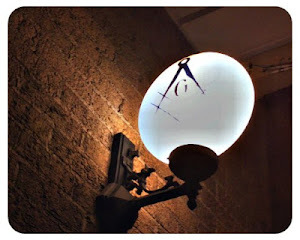 Ten minutes before the start of the ceremony, I returned to the lodge room, and turned the air conditioner off. Our air conditioner is an older system, and in addition to being slow to respond to changes, it is incredibly noisy. It is also incredibly complicated, as it has independent controls in three different rooms, and if they aren’t all set correctly it won’t turn on… or, as the case was last night, turn back off! Even though I was nearly shouting through most of the ceremony, part of the room couldn’t hear a word I said (except, of course, for when I mispronounced a name). Very important lesson learned: no matter how hard you try, some things will always be outside of your control, and you just have to learn to live with that. The ceremony itself was as beautiful as always, as the original author had a way with words that I can only aspire to. I have been lucky that, through my Masonic journey, I have been forced into public speaking at every turn, and so I was able to actually look at the people gathered there instead of “talking to the podium” as I’ve seen done so often. More importantly, for me, is that I was able to watch as each of the 104 carnations was laid, one for each deceased Past Master, and so able to honor them by remembering them, and in this I learned the most important lesson: never forget the people behind the ceremony. It’s so easy to get caught up in worrying about all of the details that we forget the reason we hold the ceremony to begin with. 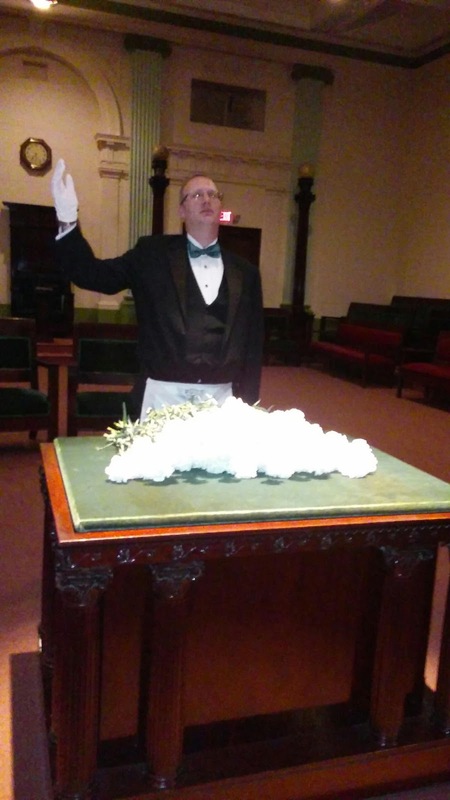 After the ceremony it was time for tearing down and cleaning up, presenting carnations to the widows, and thanking the current Worshipful Master for allowing me to have his lodge for the evening. Of course, we also had to go out for pie afterwards (for more information on the importance of pie, see my article HERE), and everyone talked about how great the evening was, but for me nothing will top the honor of getting to honor the 104 men who faithfully served our lodge in life before laying down their working tools and attaining peace at the last. WB Adam Thayer is a grumpy-ish past master of Oliver #38 in Seward, NE and Lancaster #54 in Lincoln, NE. He continues to be reappointed to the Grand Lodge of Nebraska Education Committee, as well as being an occasional host on the Whence Came You Podcast. He may be reached directly at adam@wcypodcast.com or summoned by placing a certain number of lapel pins in a special pattern around a petition for an appendant body. Nicely done...but, exactly how many pins and shiny objects/pieces of ribbon does it take? I can get that!!! To Reinvest Or Start Anew?